Flooring can look amazing when new but over time it may become dirty and marked with scratches causing it to look unappealing. Finally, you can prevent those annoying marks from occurring in the first place with this plastic floor mat. Simply place the mat in your office area and that's it! Just like that your floor is protected. The type of material that is used to make this floor protector mat is high-quality polypropylene that is scratch and scuff resistant. Sized at 36" x 48" Inches, this office floor mat is the ultimate protector for any hard floor surface. When your desk chair mat gets dirty simply wipe it with a wet cloth and it's ready to be used again. It's that easy! You could move your office mat to any location. Take it to work or leave it at home, the decision is up to you. 100% RISK-FREE with our money back guarantee. Protects any hard flooring surface like hardwood, tile, laminate, concrete, and vinyl floors. Made of high-quality polypropylene that is odorless, BPA-free, phthalate-free, PVC-free and toxins-free. Looks great on any hard flooring with its transparent material. Anti-slip and scuff resistant to provide grip and protect floors at the same time. It's Time To Keep Your Floor Protected With The Best Office Chair Mat. Click "Add to Cart" and Get yours TODAY! PROTECTS YOUR FLOOR --- This office chair mat is specially designed to protect any hard flooring surface such as hardwood, tile, laminate, concrete, and vinyl floors with its scuff resistant material. When flooring gets damaged it could be very costly to replace. It's time to protect that investment today! REDUCES LEG FATIGUE --- Moving around in a chair at your office desk or home office can get tiring especially when movement is restricted by the floor's surface. 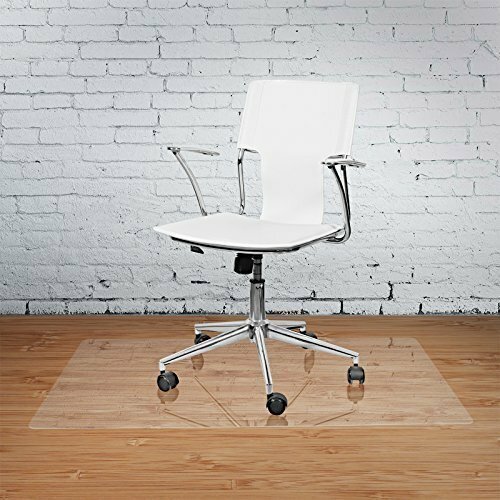 Place our plastic floor mat in the desired area and seamlessly glide around the office in your chair. You already work hard, why should your legs do the same? MADE OF STRONG DURABLE MATERIAL --- We've made our floor protector mat from high-grade polypropylene with no odor, BPA, phthalate, PVC or toxins. We made sure this chair mat is thick and sturdy to boost its durability even after constant heavy use. When it gets dirty easily wipe your plastic chair mat with a wet cloth. Buy it once and use it forever! GRIPS TO YOUR FLOORING SURFACE --- This computer chair mat is made of an anti-slip material on the bottom to prevent the mat from sliding out of position. It's made to be convenient for persons who constantly move around in their office chair and need a mat that stays in their desired position. If you have any questions about this product by Terazzo, contact us by completing and submitting the form below. If you are looking for a specif part number, please include it with your message.